The Anglo-Nordic Life Science Conference is an annual event arranged in London, UK, where selected companies and venture capitalists are invited to meet and present during a couple of days. GraftCraft were happy to be invited, and participated on the conference the 22nd-23rd of April. 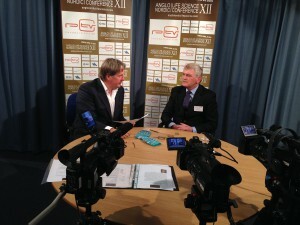 GraftCraft were also interviewed by PharmaTV (see picture). CEO Erney Mattsson presented the Unravelling Stent project and GraftCraft had many interesting meetings with investors, medtech ventures and consultants within the field. Other notable participants and sponsors of the conference were MS Ventures, Innovation Norway, Business Sweden, Merck and Nasdaq. Unravelling Stent featured at House of Sweden in Washington D.C.